David and Lisa Hoory with their children, Nina, 8, Ovadia, 7, and twins Jaclyn and Joseph, 3. When Matthew Williams, a doctoral candidate in education and Jewish studies at Stanford University, wanted to know the most affordable communities for a committed Jewish family, he looked only at communities meeting five criteria: those that have a mikvah and an eruv; a Reform, Conservative and Orthodox synagogue; K-12 Jewish day school options; and at least one kosher restaurant or kosher friendly supermarket. “Is the Motor City ripe for a Jewish revival?” he asked. It appears so. 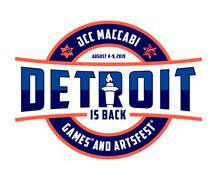 Several committed Jewish families have already figured out that Metro Detroit is a good place to raise Jewish families. Over the past few years, dozens of Jewish families have moved to suburban Detroit. These newcomers have their own stories to tell about why they chose to move here. David Hoory grew up surrounded by family. When his parents came to America — his father from Iraq, his mother from Syria — they and their extended families settled in the same neighborhood in Brooklyn. A generation later, David’s sisters live within walking distance of each other. And when Hoory met his future wife — who had always lived all of four blocks away — they married and moved, as expected, into the same neighborhood. 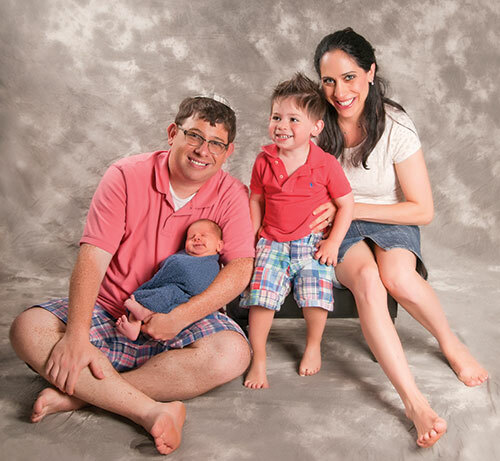 Young professionals Dr. Joseph and Leah Sanders moved to Huntington Woods from New York with their son, Moshe. Nathan is a native Detroiter, born June 14. They were drawn by work and Leah’s sister, Miriam, who married a Detroiter. Hoory developed his hard-working entrepreneurial spirit by watching his parents work at their own businesses. At a young age, while his peers were playing video games, Hoory was buying and selling video games. This and his other efforts as an entrepreneur gave him the urge to try another endeavor where he could control his own destiny: real estate sales. The next step up the ladder at his company would mean running and growing a general office as a managing partner — and a move out of New York. He contemplated opportunities elsewhere in the country, and then, about a year ago, accepted the position as managing partner of the Greater Detroit General Office in Southfield. Though Hoory marks off the items on his checklist, explaining that suburban Detroit has everything, Akiva Hebrew Day School in Southfield was the decisive factor. David and his wife, Lisa, have four children, Nina, 8, Ovadia, 7, and twins Jaclyn and Joseph, 3. The older children had started school in Brooklyn at the Yeshiva of Flatbush, which Hoory says has an educational philosophy similar to the Zionist, Modern Orthodox Akiva. West Bloomfield also offers a choice of welcoming synagogues. David and Lisa usually attend Congregation Ohel Moed in West Bloomfield, in easy walking distance of their home, and enjoy its full range of activities for adults and children. 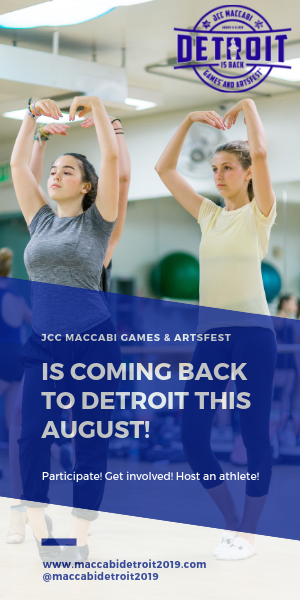 They also connect with the Sephardic congregation Keter Torah, also in West Bloomfield. Though Lisa does not come from a Sephardic background (her father is songwriter/singer Yossi Toiv of Country Yossi and the Shteeble Hoppers), she has mastered the traditions and cooking of her husband’s family. Besides, the area has clean modern office buildings, homes with expansive yards and growing trees. “Obviously, the local economy is growing, too,” he added. When Lisa’s relatives recently came to visit, the young newlyweds enjoyed their vacation in suburban Detroit and expressed admiration for Jewish life here. Now they are considering making the move. 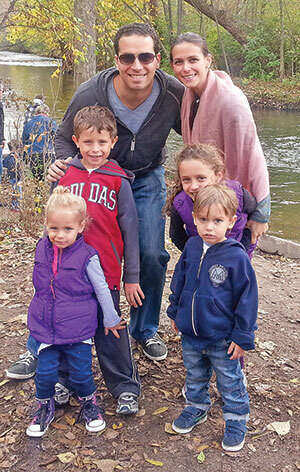 Yoel Judowitz had always lived in the New York area before he and his wife, Mindy, moved to Oak Park last year. He grew up in Far Rockaway, and she in the Flatbush section of Brooklyn. After they married, they moved to Monsey, a stronghold of observant Jewry. Last year, they moved to Oak Park. Yoel said they moved for two reasons: They felt the attraction of raising their children in an out-of-town community with a more wholesome, less competitive environment, and they could find more affordable housing in Oak Park. He likes the idea that his children can meet Jews from different backgrounds in school, in synagogue and in the neighborhood. Another advantage of Oak Park for the Judowitz family — other relatives made the move here in recent years. The Judowitzes have three children, a girl, 6, a boy, 4, and a son born in Michigan this year. 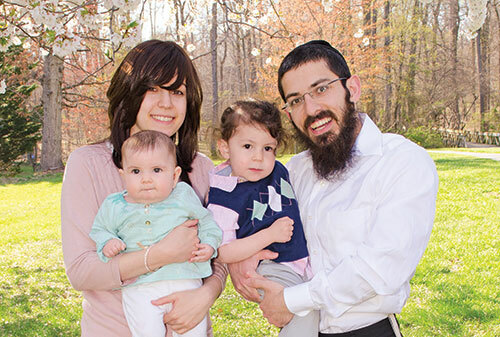 Affordable housing for this family means they rent a four-bedroom house with spacious yards for what they would pay for a small apartment in Monsey. They continue to look, calmly and carefully, to buy a house in their target area. Yoel had the freedom to decide where to live because he has a “transportable” profession. As an artist and book illustrator, he can simply send his work in from cyberspace. He also teaches science in grades 6-8 at Southfield-based Yeshiva Beth Yehudah, where their oldest child attends school. Mindy Judowitz, recently certified as a school psychologist, also will be teaching second-grade girls secular studies classes at Beth Yehudah. Former Californian Dovid Greenberg, like Judowitz, has an Internet-related profession. Greenberg runs a digital marketing agency and so can live anywhere. He and his wife, Chana, considered many options and discussed them with their rabbi before choosing to relocate to Oak Park. His wife comes from Providence, R.I., so she already understood the attractions of out-of-town life, he said. He grew up in Los Angeles, so “out-of-town” feels like a new experience for him — and he likes it. The Greenbergs have four children, ages 1-6. The oldest has begun studies at Yeshiva Beth Yehudah. His son’s teachers know every child and are aware of the stressful lives of their pupils. So teachers expect students to do their homework, but show forgiveness for students’ academic challenges and validate students who have responsibilities at home. Dovid said they could have lived anywhere, and they chose Oak Park as a good place to raise a family. He finds that people here are, by and large, more wholesome, into family and Torah values. The new Harry and Wanda Zekelman Campus of the Chabad Lubavitch Ohel Yosef Yitzchak on 10 Mile Road greatly expands the presence of the Chabad Yeshiva in Oak Park. As the school expanded, adding students from across the country and across the world, it also needed to add teachers and administrators. Rabbi Mendel Shusterman came from Brooklyn in 2013 to serve as mashgiah/menahel (spiritual supervisor) of the Yeshivah. Shusterman explains his position this way: He is responsible for knowing every one of the students, for monitoring their day-to-day progress, for seeing to their well-being, their attitude and their satisfaction. The rabbis who teach Torah to the students have a more academic relationship with them. Shusterman grew up in Johannesburg, South Africa. His wife, Rikkel, grew up in Columbia, Md., where her parents serve as the Chabad emissaries. The Shustermans have two young children, a boy and a girl. When he completed his studies in Crown Heights, Brooklyn, Mendel considered various opportunities in Jewish education before choosing Oak Park, which he is still getting to know. Dr. Joseph and Leah Sanders came to the Detroit suburbs to find a job. Last year, when Sanders, a native of Queens, N.Y., finished his training in anesthesiology and his cardiac anesthesiology fellowship at Montefiore Medical Center (Albert Einstein College of Medicine) in the Bronx, he considered posts around the country, but only in places with robust Jewish communities. The best offer came from Henry Ford Hospital, where he now serves as senior staff cardiac anesthesiologist. Leah grew up in Crown Heights in Brooklyn, earned her master’s degree in physical therapy at the College of Staten Island, and worked as a physical therapist in Westchester, all in New York. She had a particularly sweet reason to welcome the move to Metro Detroit: her sister, Miriam, had just married a lifelong Detroiter and moved to Oak Park. The Sanders have settled in Huntington Woods, just a few blocks from Miriam and her husband, Ted Rodgers. They have two sons, Moshe, 3, and Nathan, born on June 14. The Sanders family has connected to Congregation Or Chadash, Aish HaTorah and Young Israel of Oak Park. Their son, Moshe, attends Gan Shalom, the early childhood center at Congregation Beth Shalom. If our area is, as Matthew Williams puts it, “ripe for a Jewish revival,” these families illustrate some of the key factors: an affordable cost of living with Jewish amenities, employment opportunities in the general economy, in Jewish institutions or in portable Internet jobs, and the chain effect of moving to live near relatives who have moved to Metro Detroit. The local Jewish schools also work to attract newcomers. “Akiva partners with the area Young Israel congregations — an effort led by Howard and Michal Korman of Young Israel of Southfield — to publicize our school in the Modern Orthodox national community through the Orthodox Union’s Community Fair and informal avenues,” says Jordana Wolfson, chief administrative officer of Akiva Hebrew Day School in Southfield. Wolfson says the Kormans have helped 60 families, with 90 children, move into the neighborhood of Young Israel of Southfield. “We try to connect personally with families who we have heard are interested in moving to Metro Detroit or have a family connection and may consider moving here,” Wolfson says. “We also intake several calls a year from families looking for a solid Modern Orthodox community and share information and materials about our school so they are informed about our strong pre-K-12 grade Zionist, Modern Orthodox college preparatory program. Rabbi Yitzchok Grossbard, dean of Yeshiva Beth Yehudah, says, “Over the past few years, we have had the pleasure of meeting with dozens of young couples who were attracted to our community because, as they have heard from their friends and relatives, Detroit is a wonderful place to live and raise a family. He also credits the Jewish Federation of Metropolitan Detroit’s Neighborhood Project, which has kept Jewish communal institutions in place. More than 20 years ago, the Federation took a series of concrete steps to shore up these institutions by expanding the Oak Park Jewish Community Center, providing down-payment aid to home buyers in the target area and assisting with the Beth Jacob School’s move to Oak Park. Levine sees those decisions as the beginning of the dynamic that now has resulted in the most densely Jewish neighborhood in the history of the Detroit area. West Bloomfield FTW! Good selection of housing at various price points, JCC, Jerusalem PIzza, Hiller’s, Harvard Row Meats, an eruv, a mikvah (at Ohel Moed), Keter Torah, Bais Chabad, The Shul, The Mesivta. Low crime, nice neighborhoods, friendly neighbors.